I brought you pudding pie. I brought you almond butter bars. I even brought you pumpkin snickers. But today my friends, I’m bringing you a salad. Not just any salad: a healthy roasted butternut squash kale salad with juicy pomegranate seeds, crunchy pumpkin seeds and a damn good dressing. Like, lick-the-bowl type of good. When I tell someone I eat plant-based, or even just healthy, the first thing they say is, oh, you must just eat salads all day, like it’s a bad thing. Which it could be, if you were eating wimpy iceberg lettuce salads with cucumbers and tomatoes every day. Booooring. I’m hear to tell you that salads are actually really, really fun. You basically get to throw whatever you want into a bowl and EAT IT (<–that’s my favorite part). Craving Mexican? Throw some black beans, salsa, and avocado on top of some greens. Mediterranean? Go for olives, artichoke hearts, and sun-dried tomatoes. Really, salad is whatever you want it to be. So let’s make it fun and throw a salad party with this fall kale salad as the guest of honor!? I hope I haven’t lost you yet. I know my groundbreaking statements about salads actually being fun may seem far-fetched, but trust me on this one. Let me tell you about this salad. It all starts out with a tender bed of kale; I decided to lightly steam it so it’s a little less bitter and tough, but the choice is yours. Then (my favorite part!!!) I used my Inspiralizer to make beautiful butternut squash noodles that are perfectly roasted in the oven. Seriously, the Inspiralizer is up there with my NutriBullet and food processor as favorite kitchen appliances. Get. It. Since pomegranates are basically my favorite thing ever in the fall/winter, I threw those ruby red seeds in the salad for a sweet, juicy crunch. Ugh, is there anything better? I could seriously eat pomegranates all day long. Of course I threw in some pumpkin seeds, too, because it’s still fall and fall=pumpkin. It’s all finished off with a slightly sweet maple balsamic vinegar that complements the butternut squash so well. Everything blends together perfectly to create the best kale salad you ever did eat. If you don’t like kale, I challenge you to try this. You’ll be hoarding bunches of kale from the farmer’s market before you even know what hit you. If we’re being honest, I meant to add quinoa to this salad, but I didn’t remember until I had looked at my recipe notes…after I took all the photos. I think it worked out without the quinoa though because it makes a great, light salad to bring to all your Thanksgiving dinners! That being said, I think quinoa would be lovely in here. Also, I can’t wait to try this with crispy roasted chickpeas for a more filling salad. Let me know if you bring this fall kale salad to any Thanksgiving parties! Or if you make it for yourself and don’t share it with anyone. This fall kale salad is bursting with roasted butternut squash, juicy pomegranate seeds, and crunchy pumpkin seeds! It’s perfect for holiday dinners. Preheat oven to 400F. Lightly grease or spray a baking sheet. If spiralizing, cut the long neck of the squash off of the bulb section. Cut the ends off. Set aside the bulb for later use. Peel the neck. On the Inspiralizer, I used Blade C to create linguine noodles. Spiralize the squash; cut the noodles into shorter pieces and measure 6 cups. Place on the baking sheet and drizzle with olive oil; toss. Bake for 6-8 minutes. If cubing, cut the long neck of the squash off of the bulb sections. Cut the ends off; peel both pieces of the squash. Scoop the seeds out of the bulb. Cut the squash into 1/2-inch cubes. Place on the pan and drizzle with olive oil; toss. Bake for 20-25 minutes, until the squash is tender. Meanwhile, lightly steam the kale in a large skillet or pot (optional). Place kale in a large bowl. Add pomegranate seeds, pumpkin seeds, and butternut squash to the bowl. Toss to combine. In a small bowl or jar, add olive oil, balsamic vinegar, maple syrup, mustard, cinnamon, salt and pepper. Whisk or shake to combine. Pour dressing into the bowl; toss until fully combined. 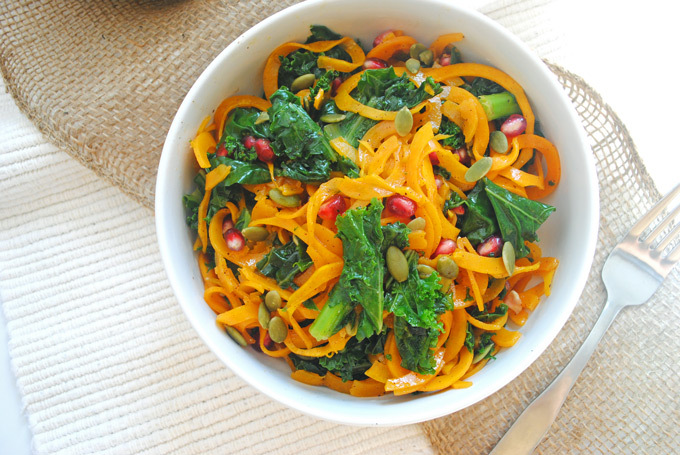 Ohhh I love Kale but I have not mixed it with butternut squash… this looks sooooo good and filled with flavor! So many flavors in one big salad! You won’t regret making it! Don’t you love fall/winter flavors? So delicious! Your recipes never fail to entice me! Adding this to my thanksgiving recipe list -though I may sub the butternut squash for carrot or sweet potato because I’m not a fan of butternut squash ? Thanks so much for reading, Kerri! I think sweet potato would be great here, or any other squash you like. I’ve got access to everything I need for this, except the spiralizer. I so need one of those in my life. Also, the pics in the post are bomb!! I reeeeeeally recommend a spiralizer; it’s a great way to get in more veggies, and it’s just super fun to make noodles 😉 Trying to improve my photography with every post!! yaaasssssssssssss!! this is absolutely beautiful, Emilie!! I am over here drooling! Thanks so much Christina!! Trying to get better with every post 🙂 You definitely need to make this! Mmm I just love the pop of pom and the crunch of the pumpkin seeds! So perfect! Pomegranate = my life right now. Seriously. Woah. This looks AMAZING! The colors are so bright and beautiful… I just want to dive right in!! Love the spiralized squash! Spiralizing just makes food so much more fun. This salad is gorgeous and full of so many things I love. Yum! I get so giddy when I make veggie noodles, haha. It’s really all the best fall flavors in one big salad! Thanks so much, Erin!! I’m always trying to improve my photography. The dressing is to die for! Loooove the spiralized veggies within the salad! The combo of colors (and your photography) is gorgeous. Sharing on Facebook this weekend! This salad looks so good. I love the combination of flavors! It’s the perfect fall salad! Those sweet potato spirals. SWOONING over here! YUM. This really is the perfect fall salad treat! This looks divine! Love all the use of fresh vegetables here esp the kale and squash. It’s finally starting to cool done here in New Orleans and I’m looking to use more seasonal food now! You’re in NOLA??? I’m just next door in Baton Rouge!! Thank goodness it’s finally cooling off. Loving all the farmer’s markets! I’m always on the look out for tasty new recipes to make with my spiralizer. Pinning for later! Thanks, Rachel!! Hope you love it! I love how you spiralized the squash! So awesome. I love spiralizing my veggies. I’ll have to try it with butternut! It’s such a fun way to get your veggies in! I’m drooling this looks so amazing. GREAT flavors!! Totally going to try something like this next week. You definitely need to! So many good flavors. YUM this looks so good. I love salads – like you said so fun! I seriously need to get an Inspiralizer — those butternut squash swirls just look so delicious. I’m sure this would have been good with the quinoa as well but even lighter without! The Inspiralizer is seriously AMAZING! It would be delicious with quinoa, but it makes a great side salad without it! This looks so good! I have been slacking on my roasted butternut squash consumption this fall so I need to make this ASAP! It’s SO good and so good for you, too!! When it gets all caramelized ? What great colors! Hooray for non-wimpy salads! THIS looks so so good! The picture with the inspiralizer made me want to stop and hang that picture on my wall. You go girl, keep up the amazing recipes (and pictures)! This is beautiful! I’ve never thought to put spiraled veggies in a salad. Awesome idea! It’s a fun way to spice up a normal salad! Thanks!! It’s a fun way to spice up a normal salad! Haha love it! Clearly great minds think alike but I love your addition of pepitas and spiralzing the squash is totally genius. Right now I have a janky zoodler that can’t spiralize anything but zoodles lolol but hopefully I’ll pick up a spiralizer soon! Hope you had a wonderful weekend. Thanks Georgie!! The Inspiralizer is seriously amazing. You gotta get one! You’re right about salads! Everyone thinks they are super boring (myself included! ), but you know what made me like salads? Kale! Yup. A lot of people don’t like kale, but I LOVE it and it is the main type of leafy green that I use for my salads at home. I put kale into every smoothie I make! I also prefer vegetable salads over lettuce salads, so I started eating a lot of tomato cucumber salads, black bean & avocado, etc… and it really helped me to enjoy salads more. This will be the next one I try for sure. I eat a lot of butternut squash, but haven’t tried it in a salad yet! I love kale in smoothies!! I also do love vegetable salads (like my Greek Chickpea Salad!) but I try to get in leafy greens as much as possible. You have to try this salad; all the flavors blend together so well! Beautiful, mouth watering photos! I love kale and butternut squash together, and the rest of the ingredients really make this salad! Thanks!! I had never tried them together, but all the flavors blend together so well! This looks incredible. I plan to make this for Thanksgiving, but I need to make it the day before. Do you think it will still taste as delicious? Obviously, I won’t toss it with the dressing until the last minute, but do you have any other tips for preparing it early? Thanks and keep up the awesome site!! Don’t you just love spiralizers? I can’t get enough of mine. This recipe looks so healthy and delicious, perfect for the fall! Really glad you reposted this one – it’s one I definitely need to make. I like that this salad takes care of both the veggie and the starch sides for a meal. With the combo of quinoa and toasted chickpeas this would definitely be a good main dish. I really like the idea of the dressing for this salad, too – simple, with ingredients I always have on hand. One thought for the kale is possibly massaging it, as a sub for steaming it lightly. Glad you like your Inspiralizer. I got one when they first came out, and even though the one I had was good, the Inspiralizer is the best. It’s a perfect one bowl meal! I totally agreed that massaged kale would be great here. The Inspiralizer is one of my favorite kitchen gadgets! Made this tonight, and it turned out really well – as I suspected it would. Even my husband thought it was very tasty This time I cubed my butternut squash, but next time I think I’d rather spiralize it. Thank you for a definite keeper recipe. I’m so happy you made it, Susan! Spiralized is great because it’s easy to get some squash in each bite, but I’m sure cubed was delicious. I hope you keep making it all winter! Oh those colors are gorgeous – and such a healthy tasty lunch! I have to get these ingredients now! Thanks! Looks delish! I am wondering if I can make this ahead of time? I’m traveling out of town to a potluck and arriving two days before. Maybe make everything but pour the dressing on before serving? Or is it good to let it all marinate in the dressing before serving? If so, how many hours should it marinate? Thanks. I think making everything before and drizzling the tahini when ready to serve would be the best option! Let me know if you try it. Thanks for the reply. I didn’t see tahini in this recipe. Are you thinking of another recipe? I can’t wait to start making this again now that it’s squash season! Thanks, Emily!